Here's another tip from guest columnist Wendy Nan Rees about traveling with your dog over the holidays. Can you believe it, the holidays are here again! I swear, as I get older the time goes faster and faster. This week's tip is about traveling with your dog over the holidays. Of course, you could board your dog or hire a sitter for him, but if you are going to travel at holiday time and want to take your dog with you, here are a few tips to help you prepare for the journey. Traveling with a small Toy dog that weighs less than 20 pounds poses certain problems. If left loose, your pet may wind up someplace dangerous like under your brake and gas pedals. Have you even seen a small dog looking at you from the rear window or dashboard of a vehicle? While this may seem cute, this kind of freedom can be extremely dangerous to both drivers and pets. For these reasons you should consider installing a dog safety seat. There are several varieties on the market, and most strap securely into your car in a matter of minutes. Next, we have the medium to large-sized dog category. Unfortunately, vehicle safety is frequently overlooked for these family members. Just like you, your dog should be properly restrained when traveling to guarantee a safe and comfortable trip for all concerned.The solution is simple; get a safety harness for travel. These devices attach directly to your car seat belt. While they may look restrictive, they really aren't. They allow your pet to stand up, sit or lay down in relative comfort. What do you do if you have a fretful dog? Your dog may get anxious or fearful when traveling, but this is no reason to exclude him from the fun. If you have a restless dog that paces or looks for a comfortable place to hide, this can create a dangerous condition for the rest of the occupants of the vehicle. Any sharp turn or sudden stop can send your dog flying. This can result in a serious accident.Take heart, there is a solution: use a crate or a carrier for your "Nervous Nellie". Don't forget dogs are den animals and feel secure in enclosed spaces. If your crate is the proper size, it will offer the den atmosphere your dog looks for in stressful times. If you need an extra calmative for your pet, you can try flower essences or some of the other natural calmatives on the market today. There is even a biscuit, called the Ultra-Calm® Biscuit that you can give to your dog before your departure. Wherever you are going, be it hotel, motel or house rental, get in touch with management before you go to make sure pets are welcome. Find out if there are any extra fees or deposits involved with your visit and whether or not they are refundable.Find out if your dog is allowed to be in the room unattended. If the answer is yes, ask if he needs to be crated. You might even want to consider requesting a room on the ground floor. This will make those evening walks easier. There are many hotels today that are pet friendly. These include La Quinta Inns, Loew's Hotels and Orient Express Hotels. If you are a visitor to Los Angeles, the Beverly Hills Hotel will make your dog welcome with their "Canine Connoisseur Program". They have everything from doggie dishes to beds, personalized homemade cookies, a room service menu and even a 24-hour dog walking service. There are many Bed and Breakfasts that also welcome pets. Just make sure you call in advance to get information. Before you travel, make sure your dog is up to date on his shots, and it's also a good idea to request a health certificate and keep it on hand. If your dog needs any prescriptions, make sure to pick them up before you leave. If you are contemplating giving a prescription sedative, make sure you do it under your vet's supervision, and make sure to try it out before you leave so you can gage your dog's reaction to it. If you aren't sure you will be able to find your dog's usual brand of food where you are going, be sure to bring enough along for the duration of the trip. If the only time your dog gets to go in the car is to take a trip to the vet's, just popping him in the car and taking a long trip may not be a good idea. 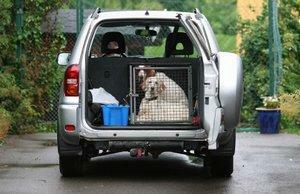 Acclimate your dog for the ride ahead by taking short trips. Start out with a trip around the block, then try a bit longer drive. This will show your dog that a car ride can be a fun experience, too.